Without a songwriter, there is no song. Before a song can shoot into the Top 10 or win a Grammy Award, someone has to do the hard work of creating it in the first place. And that always starts with a man or a woman with a melody, a guitar riff or just a scrap of a lyric. 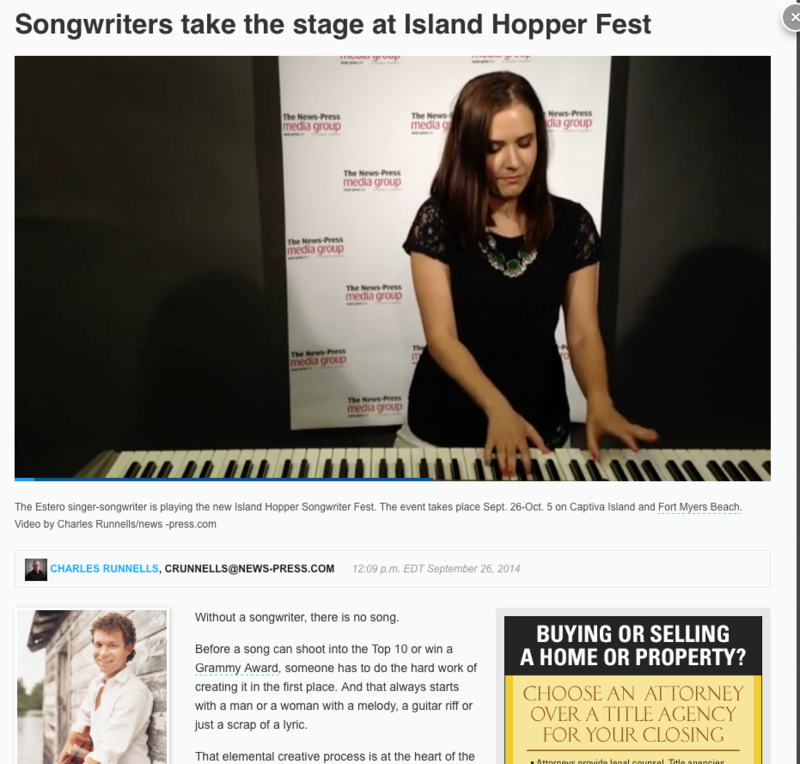 That elemental creative process is at the heart of the new Island Hopper Songwriter Fest, a two-week event that celebrates songwriters with concerts at 20 venues throughout Captiva Island and Fort Myers Beach. More than 50 regional and national acts are expected to perform 88 shows between today and Oct. 5. They’ll play mostly country and other forms of American roots music. The News-Press recently chatted with two of those songwriters about their songs and the songwriting process. Here’s a look at Estero singer-songwriter Chloe Friedman and Nashville hitmaker Keifer Thompson of the country duo Thompson Square. • How he writes songs: Thompson usually co-writes with his wife and Thompson Square band mate, Shawna Thompson. Sometimes the process starts with a cool guitar riff or a nice-sounding chord progression. Sometimes the words come first. • The story behind the songs: Raw emotion often results in the best songs, and that’s certainly true for the Thompson Square hit “If I Didn’t Have You.” The song was inspired by the death of Shawna Thompson’s father. So Thompson looked in his iPhone notes to see if any lyrics or themes fit the melody. And that led to a song chronicling the history of Thompson Square. • Tip for aspiring songwriters: If you’re serious about becoming a professional songwriter, move to Nashville or some other major music city, Thompson says. That’s where you’ll find a support network to help you improve your songs and get them on the radio. Of course, it all depends on your goals. And if you’re just writing music for fun, you can stay right here in Southwest Florida. • How she writes songs: Friedman says she gets ideas for songs all the time. A melody will pop into her head or a friend will say something that inspires a lyric, and she’ll record it in her journal or sing it into her iPhones’s Voice Memos app. • The story behind the song: Friedman wrote the pop tune “Cinderella” as an inspirational anthem for women going through the ups and downs of dating. The story’s message: Keep treating yourself like a princess, even though Prince Charming hasn’t quite come along yet. Friedman calls her family “Disney freaks,” so it was only a matter of time before that influenced one of her songs. And what’s more Disney than a fairytale princess? Friedman hopes the song inspires women and keeps them searching for that fairytale relationship. • Tickets: All shows are free except Sunday brunches at ‘Tween Waters Inn and Pink Shell Beach Resort.